Where are they? How do they show up in spring or summer? Many butterflies pass through a few generations during the warm months, but the “fall brood” doesn’t simply die off. Migration is rare in butterflies. Here are other ways butterflies overwinter, with examples of species commonly seen in the eastern U.S. 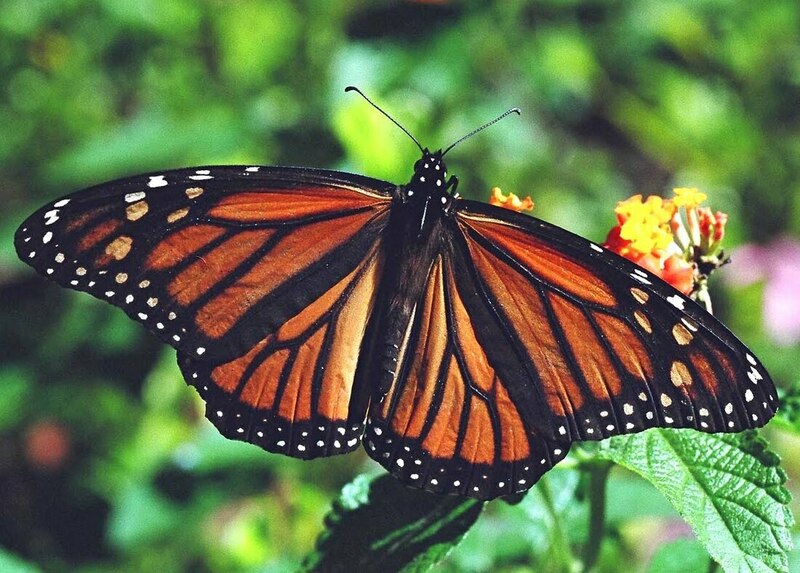 Whether they overwinter as a chrysalis, larvae, egg or adult, physiological changes occur that enable butterflies to survive the cold. The blood becomes enriched/thickened with sugars or alcohols, which lowers the freezing point; water content in the body decreases; and cellular water is bound to proteins to minimize crystallization. Make a chrysalis: The last generation of the year remains in the chrysalis in a dormant state for the winter. You can help ensure these beauties survive by leaving your perennials standing through the winter and by raking some leaves into your flower beds. This also create good insulation and mulch! Crawl into a seed pod. Larvae that mature in fall crawl into seedpods to hibernate for the winter. In spring, they pupate and transform into butterflies. Curl up in a leaf. Groups of butterfly larvae crawl under a leaf and curl it around themselves to make a shelter. To get the leaf to curl, they wrap a silk thread around it, and the thread shrinks as it dries, pulling the leaf over. Chill out as an egg. Females lay their eggs the eggs remain dormant through the winter and hatch in spring. Now that you know that butterflies and other pollinators need plants and brush cover to complete their life cycles think about how your garden can help them overwinter. When you are cleaning up your garden in late fall, preparing for the winter, use caution! When you trim branches and tidy up, set the branches and leaves aside in case there are caterpillars or chrysalides hiding on them. Rake leaves into garden beds to provide cover for overwintering butterflies. Leave faded plants until the weather warms in spring. In the spring, after they have had time to emerge, you can compost or otherwise dispose of the material without harming butterflies. Click on the button above for the story. Click on the photo for story. Valerie Burns' house in Minocqua. Recent research suggests that pollinators do better in urban environments, yet these mowed, mulched, and managed landscapes frequently lack a sufficient amount of nesting habitat needed to support large numbers of bees. As wild bees move off ag lands and head for the cities and suburbs, they may struggle to find their “dream home” amongst ours. Click on the photo for more. . . The first complete bee census in Michigan has confirmed a new species and revealed that the actual number of bee species in Michigan exceeded earlier estimates. For the FULL STORY, click on the button below. The Oneida County Land and Water Consevation Department hosted this year's WLWCA Summer Tour. About 25 participants were treated to a tour of the Roadside Pollinator Habitat, the James Lake Farms Organic Cranberry Marsh, and the Three Lakes Winery, Garden and Orchard. Presentations that were part of the August 29th Pollinator Workshop can be viewed below. Bee Better Certified(TM) works to give bees a healthy place to live. It also helps incentivize farm practices that benefit pollinator populations counteracting production trends that jeopardize the pollinators upom whom we depend.